Construction of an unusually wide basement box in poor alluvial soil requires exceptional lateral support for the piled retaining walls. The traditional method of bracing such an excavation is to install a specially designed framework of structural steel – a method which is both expensive and time consuming. Furthermore, the limitations of structural steel mean such a framework invariably intrudes into the basement, making work within the excavation both diffi cult and potentially hazardous. A better solution is the use of proprietary hydraulic struts which do not require any on site welding, are quicker and safer to install and can be supplied with real-time load monitoring for added security. The Riverside Quarter is a major residential development on the banks of the Thames at Wandsworth. The client, developer Fraser Property, has already completed 204 apartments on the site and is now embarking on the second phase which will deliver two new tower blocks housing 121 new private apartments in 2012-13. Main contractor Galliford Try is currently excavating the joint basement box for the two new blocks to be built on site. The success of this phase of the scheme is vital, since Fraser Property intends building another seven apartment blocks within the Riverside Quarter if market conditions allow. All eyes are therefore on these two tower blocks as negotiations begin on the next phase of the project. The two new buildings are being constructed out of a joint basement box currently being excavated on the site. 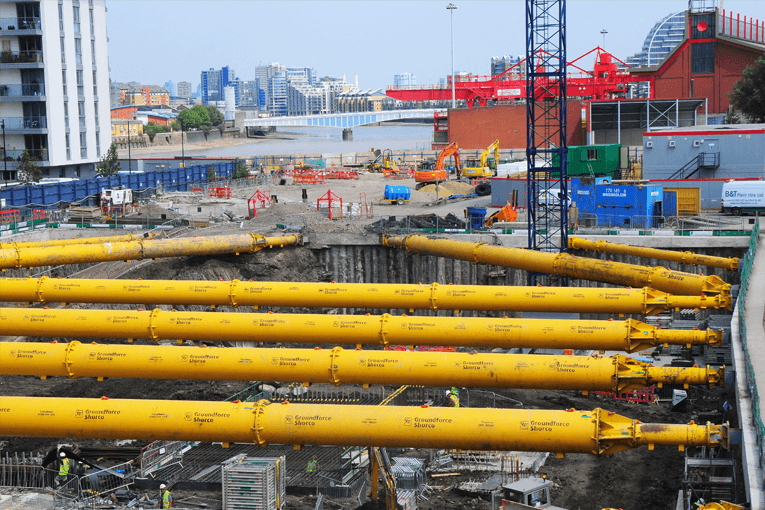 The excavation is notable for its size – almost 50m at its widest – and to ensure rapid progress, main contractor Galliford Try and their sub contractor O’Halloran & O’Brien, have chosen to use a modular hydraulic shoring system rather than bespoke steelwork. The main advantages of using a proprietary modular propping system are speed of installation and the ability to create a clear space in which to work beneath the supports. But having opted for this method, Galliford Try faced two challenges: the first was to find a system capable of spanning this wide excavation without the need for intermediate vertical support. The second was to measure and record the lateral forces acting, including the effects of thermal expansion and contraction on the long steel struts. Galliford Try/OHOB chose Groundforce Shorco’s MP250 props, the strongest standard modular propping system currently available in Europe. After installing a concrete secant-piled retaining wall around the perimeter of the excavation, the contractor excavated the fi rst 1.5m of soil so the retaining wall could be topped with a capping beam. The 12 hydraulic props were then installed against this capping beam and pre-loaded, allowing the contractor to start excavating the basement to its full depth. As the excavation progressed, the horizontal forces acting on the hydraulic props were recorded via a built-in wireless load monitoring system. The props used on this project are all MP250 modular hydraulic units with a maximum axial capacity of 250 tonnes. Four are used to support the excavation at its widest - with a span of 47.5m, these are the longest horizontal span props Groundforce has ever employed. These four, plus one other long-span prop, are fitted with Groundforce’s 1.22m diameter Super Tube extensions which give the props the stiffness required to provide support across wide spans without recourse to intermediate supports. They are also pre-cambered to counteract for self-weight defl ection over long spans. The remaining seven props use the standard 0.61m diameter extension tubes. To verify that the horizontal loadings remain within the design parameters, Groundforce has supplied its new wireless load monitoring system which allows the actual load in the hydraulic props to be measured and recorded from any remote location. The system comprises a specially-designed electronic load pin with integrated pre-calibrated strain gauges. These load pins are linked via a short cable to a battery-powered data acquisition module housed safely inside the strut’s steel casing alongside thehydraulic ram. This module can be accessed via the internet, SMS messaging or from a roaming handheld device, allowing loads to be monitored in real time. The system can be set up to send automatic alerts if loads approach the props’ maximum capacity. On this project where extra-long props are used, a temperature change of between 10–15ºC can alter the loads on each prop by as much as 60 tonnes as a result of thermal expansion and contraction. Whilst the hydraulic system can absorb some of this additional load, the monitoring system allows the site engineers to keep track of these fluctuations, build up a picture of what is happening and provide peace of mind for all parties. Groundforce Shorco is providing on-going technical advice to Galliford Try & OHOB throughout the groundworks phase of this project. Besides providing the electronic remote monitoring system, Groundforce will also provide on-site assistance when the time comes to decommission the hydraulic support system. Installation was very straightforward because the struts were supported by the unexcavated soil within the retaining wall. Removal however, will require temporary support for the props which weigh up to 28 tonnes each. The team is planning to use the new B1 basement slab to provide this load-bearing function.